Oklahoma City – In a room filled with city leaders, developers, bankers, and other civically engaged residents, developer Gary Brooks issued a challenge to business owners.“ If you’re a leader in your company, you need to start calling (Firstep) and get them in your business,” he said. 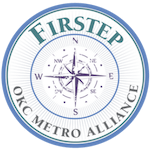 Firstep is a work and recovery program, administered by OKC Metro Alliance. The co-ed program helps people recovering from drug or alcohol abuse get back on their feet. About half of the men in the program are ordered to participate by the court. The other half are there voluntarily, said Connie Schlittler, executive director.